Went to the opening Matt’s ‘resounding rivers’ project last night. I recommend going along to some of the sites while it’s on! Belfast’s forgotten rivers, waterways and associated industries have been given a renewed presence within the city. Six sound installations have been assembled at six different sites across the city. Each installation can be heard out in the street, presented as an enhancement of the everyday sound space. 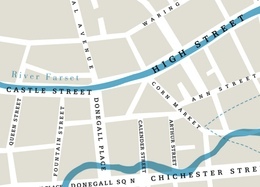 Each site has been selected because it is situated upon, or by, the previous route of one of Belfast’s three central rivers. Two of these rivers, the Farset and Blackstaff, no longer flow over ground – they are constricted to large pipes running beneath the city. The third river, the Lagan, is still a prominent feature in Belfast but was once much wider. By deepening the Lagan’s channel, a great deal of land has been reclaimed and built upon. The sound that is presented by each installation is a re-imagining of what the city’s buried and constricted rivers and waterways might once have sounded like. Each of the six sites would have had a different relationship with its respective water source, and this is reflected in the delivered sound. In order to achieve this re-imagining, locations in Northern Ireland with similar water features to those previously found in Belfast have been visited and recorded. Pick up a map at PLACE! Project conception, audio production and installation by Matt Green. Graphic design and video installation by Ryan O’Reilly. Advice and guidance by Ruairí Ó Baoill. Resounding Rivers was made possible by funding from Belfast City Council. The video above documents Robin Price‘s “Journey Through a Burning Brain” installation, as shown at the TWO thousand + NINE symposium held in SARC last week. The simple exterior appearance of an old TV and oversized remote control hides a complex two-laptop system that harvests YouTube video’s based around a keyword, before segmenting the videos and rearranging them with a Euclidean rhythm generator, finally spitting out the visuals through a Rutt Etra video synth. Using the remote, you can select different videos which in turn influences which videos are being downloaded in real-time during the installation. For more info visit the original post by Robin. This video shows the prototype of Christopher Chong’s installation “The Sonic Window” in which a multi-touch screen is used to navigate around a soundscape generated from Second Life. Here are two videos of Robin Price‘s audio-visual radio installation. The top video shows just the visualisation and the lower video shows the whole installation being used. Robin is a colleague in SARC and is working on database-driven musical interfaces/instruments. 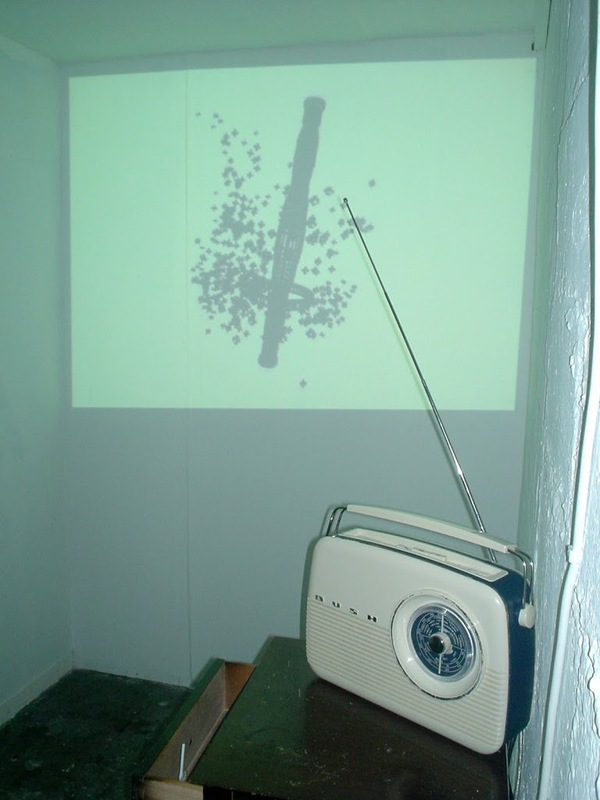 The radio installation shown here builds a database in real-time of sounds from the radio, which are then placed back in the radio-stream as the user plays with the radio. Here’s a video of the Bliptronic3000 installation in the Big Blip exhibition held in Brighton 2006. This was a joint project between myself, Sean Toru and Lisa Tutte-Scali. Attended the private view of Robin Price’s and Tom Davis’ show in the Catalyst art gallery. Robin’s installation consists of a modified radio that can be used to create on-the-fly electroacoustic music, with an accompanying projection showing a visualisation of the process. Tom’s was the balloon and motor installation that has previously been described on this blog. More information on the radio project can be found here. Helped Tom Davis install his piano-wire, balloons, motors and piezo installation in SARC‘s sonic lab. 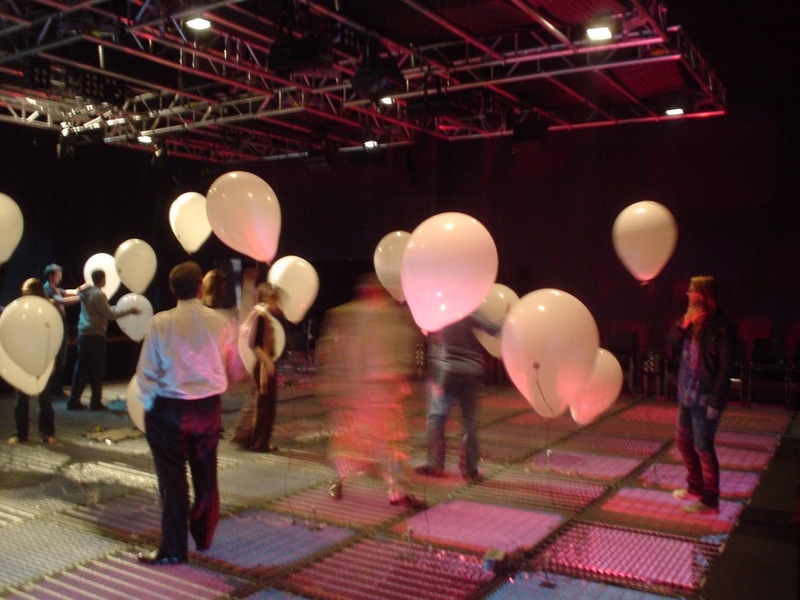 Piano-wires were strung vertically between the floor panels and the lighting-rig each with a balloon attached to act as an amplifier. Each balloon had a piezo (contact mic.) attached to it which were used to drive the motors to pluck another balloons string. 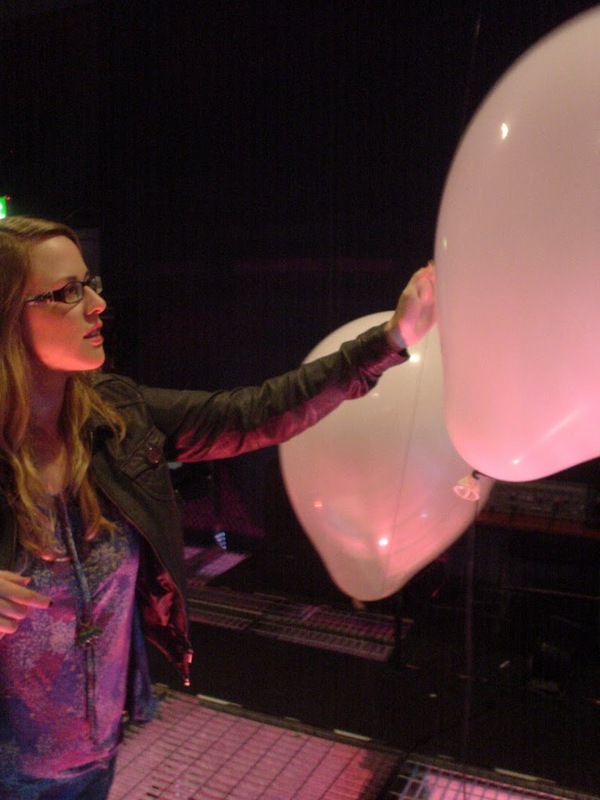 Complex feedback occurs when a balloon or string is touched by the audience.